Aquarium Throne And Scribbles’ Birthday Cake At Nestco! Wow, we’ve had the arrival of two brand new nest items at Nestco, which will look absolutely Bin-tastic in a nest room! First of, we have the Aquarium Throne. I must admit, this throne looks dazzling in your nest and very royal. It was designed very well, as it has an aquarium with real fish in it at the back! I hope you haven’t forgotten all about Scribbles’ birthday! And what would a birthday be without a cake? Luckily for you, Pop22 has got you covered, she has created a wonderful, not to mention Bin-tastic birthday cake! Weevil on over right now to Nestco to collect these two brand-new nest items! Don’t forget, you can visit Scribbles’ nest all this week and wish him a happy birthday! Scroll down to one of our previous posts for the details. Brand New Hi-Tech Nest Items on Sale Now at Nestco! BREAKING NEWS! Scribbles recently reported that he saw the Nest Inspector with some mysterious crate! You’ve all been sharing your theories of what could be inside them, on the What’s New Blog. Well, I can now reveal that the mysterious crate was holding some nest items. Not just any old nest items though, these nest items are Hi-Tech! How Bin-tastic is that? These brand new nest items are awesome! They cost quite a lot of Dosh, but they’re deffinetly well worth it! To get these brand new nest items, weevil on over to the Shopping Mall and enter Nestco! There’s also a brand new ‘show room’ which looks really, really good! This new showroom is called ‘Hi-Tech Kitchen’. It costs 230 Dosh and you’ll have to be a Bin Tycoon Member to buy it. Weevily wow, doesn’t that new showroom look amazing? I hope you all have a Bin-tastic Friday and remember that this weekend is a bank holiday! Stay tuned for a post showing my new nest room with the Hi-tech items. People across the world will be switching off their lights to show they appreciation of our earth! In London, Big Ben will be switched off, and many people across the world will be doing the same. It’s best to turn off your lamps, lights, and Televisions at 8:30 PM tonight. Earth Hour comes once each year, but we can all do small things to help the environment each day! We can make sure we recycle, put our rubbish in Bins instead of throwing it on the ground. or we can bring a cloth bag when we go shopping instead of using a plastic carrier bag. Little things like this helps the environment! 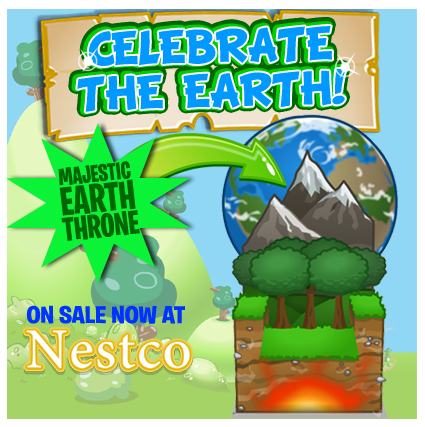 Be sure to head over to Nestco to pick up the all-new Earth Day Throne which has arrived in stores, that’s a great way to show your appreciation for the earth! Bin Weevils is celebrating Earth Day 2014 and you can now buy the new Majestic Earth Throne which is on sale at Nestco, this is a great way to show off your appreciation for the earth, celebrate the earth weevils! This throne is very stylish, and interesting, leave your thoughts on the new throne in the comments section below! Final Day To Get Your Hands On Some High Level Items With The Level-Free Sale! Attention shoppers! Wow, has it been that long already? Today is the final day to get your hands on a nest item you’ve desired to have for a very long time, with a no level limit! Remember to grab as much nest items as you can because by tomorrow, it will all go and the levels will be back to normal. I really enjoyed this Level-Free offer because it helped my other Bin Weevil accounts have better nest rooms with special nest items inside! What nest item have you got, which used to require a very high level? Leave a comment in the comments section below and tell me. So what are you waiting for? Head on over to Nestco or Bin Mart inside the Shopping Mall and get buying those nest items before the levels go back to normal!